The majority of the population in the Ancient Regime society worked in farming, cultivating cereals which were the base of the diet. Very simple techinques were used to grow cereals. In essence, the triennial crop rotation was the most popular farming technique and obviously the yield was very low. The church and the nobles owned large states still managed under the manorial system with high taxation on their inhabitants. Farming increased in the 18th century. New crops from America (corn, potatos) were introduced so diet became more varied and balanced. On the other hand, new technical innovations were introduced in the United Provinces and England where the four-field crop rotation was practiced. 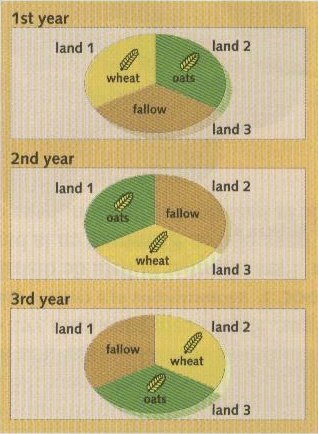 However, in the 18th century land was not left fallow and the four field crop rotation became a key development in the Agricultural Revolution.Therefore, yield experienced a significative growth although manorial system persited. During the Early Modern Age metal and textiles were produced in city workshops controlled by the guilds. In the 18th century, production grew due to the population growth and the constant increase of the demand. New production systems were implemented to avoid the guild´s control. Domestic system or putting -out system was the base of manufacturing in the 18th century. It was carried out in homes under the domestic system, especially the weaving of cloth and spinning of thread and yarn. The development of this trend is often considered to be a form of proto -industrialization, and remained prominent until the Industrial Revolution. Manufacture system was based on huge specialized workshops where craftsmen worked for the state (= royal companies in France and Spain) or for a private owner producing luxury goods in exchange for a salary. As far as you know, domestic trade in the Ancient Regime was limited due to lack of good roads. It was based on local markets where vegetables and fruits were exchanged for semi-elaborated products. Long distance trade was concentrated on international ports connected with colonies all over the world. During the 18th century , domestic trade improved as roads became more accesisble, new cannals were built and agrarian and manufactures production increased. Long distance trade was based on the fact that colonies supplied European countries with coffee, tea, cotton, sugar, precious metals while manufactured products and slaves were sent from the metrópolis. Long distance trade generated great profit. Accumulated capital contributed to the merchant capitalism development as well as the joint – venture companies creation and the banking and stock-exchange markets implementation.